Once there was a boy who had to leave home…and find another. In his bag he carried a book, a bottle and a blanket. In his teacup he carried some earth from where he used to play. Teacup is the story of a displaced boy who travels in search of a new home. His teacup yields a surprise – a tree that grows as he lives upon the sea. Eventually he finds an island, where he sets up home and waits for company to arrive. From the first page the stunning images of rolling clouds, roiling seas, massive whales and more draw the eye away from the text which, printed in white, almost disappears into the page – echoing the very understated nature of the narrative. The story is slightly whimsical – with the idea of a tree growing in a teacup, and the absence of any adults or explanation for the boy’s need to find a new home – which enriches rather than diminishing the parallels with the plight of refugees who take to the seas looking for better lives. There is plenty of room to discuss both what is happening in the story and these parallels. 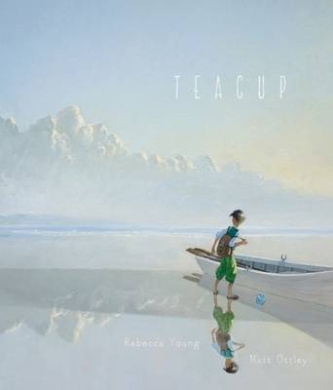 The combination of Rebecca Young’s gentle text with Matt Ottley’s incredible artwork makes for a breathtaking whole. It was of a species facing a very high risk of extinction and it was killed to the north of Prydz Bay, eastern Antarctica, in a whale sanctuary. So begins Harpoon, a detailed exploration of the history of whaling, a book which is both enlightening and disarming. At the same time as it provides an in-depth expose of current and past whaling processes, it shows the problems that anti-whaling protestors are up against. This is not just a book for those with an interest or passion for whale conservation, although of course the books will be both a useful tool and a motivator for such readers. At the same time, for those who are aware of the whaling conflict, but choose to stay removed from the situation, Harpoon will be a wake-up call, detailing unemotively the facts of whaling practice and the pressures faced by today’s whale numbers. Author Andrew Darby avoids being didactic or preachy, presenting the information in an ordered, reasoned way and leaving readers to draw their own conclusions. This is perhaps why the book hits home so hard.